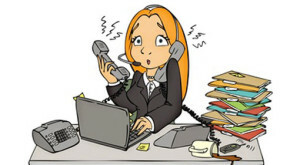 Job stress making us sick? Researchers analyzed data from about 12,000 workers in Sweden. High levels of job stress increase the risk of sick leave due to mental health disorders, a new study suggests. Over five years, about 8 percent of the workers took mental health sick leave. Three-quarters of those who took mental health sick leave were women. Workers with demanding jobs, high job strain and little social support at work were at greater risk for mental health sick leave, as were those with unhealthy lifestyles. Smoking was also cited as a significant risk factor for mental health sick leave, but alcohol use was not. Take steps and avoid these circumstances. Sometimes we engage in tasks at work every day that we could do in our sleep. Sometimes we stick to same position for three to five years without any new possibilities or opportunities to grow. Sometimes it’s important to keep on the cutting edge and to keep your intellect engaged on the job. Because in this economy, most industries are innovating rapidly. Be inspired rather than be bored. Sometimes you are unable to complete a task uninterrupted because others invade your workspace. Sometimes workplace is driven by gossip, back-stabbing, favoritism or nepotism. Chances are you can do little to change environment where these problems exist. Such offices with boundary violations are typically headed up by those who have bad boundaries themselves, and the behavior bleeds down from the top. Save yourself. Sometimes we tolerate high-stress jobs for so long that we literally become ill, suffering from physical conditions such as stomach ulcers, hair loss, or emotional conditions such as depression or severe anxiety. Sometimes we self-medicate with alcohol or drugs. Get out now. No job is worth your health — even if high-paying, powerful. Staying put in such circumstances, and it only gets worse. Strive for a life in balance. Resolve to get it. Sometimes even senior executives tolerate abusive behavior from their higher ups on a daily basis. Sometimes abusive behavior continues and constitutes screaming at you, throwing things, belittling and humiliation in front of others, or threatening your job routinely. Shun the abuse and the abuser. You have options. Repair your self-esteem if you have internalized any of the abuse to which you’ve been subjected to. Then start taking action to get out. Revise your resume and start sending out applications. Conclusion: Making the choice to move on from job that no longer serves you is important for greater balance, success and joy in life. Be open to new possibilities and take action. With the right skills, dedication and perseverance, you can find what you would like to do next.